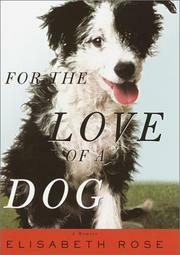 A memoir by novelist Rose (Body Sharer’s, 1993) of the dogs she has known and loved—a celebration both of the animals themselves and of the lessons she learned from them. As a child, Rose’s religious faith was shaken when the minister at her church told her that animals had no souls—an attitude that seemed to mock the love she felt for her fox terrier, Patches. A neighborhood character, Patches was only interested in Rose if she was “doing something new with her like teaching her to climb trees.” A deeply religious and thoughtful child, Rose felt she couldn’t love a God who didn’t love all creation, and her spiritual journey (she eventually became a Catholic) intensified after her marriage, when she and her husband acquired a border collie they named Kierney. Extremely high-strung and emotionally dependent on Rose, Kierney was also remarkably intelligent. She had a “vocabulary” of about 130 words (e.g., when told that her ball was in the bedroom, she’d head there directly), but she remained extremely insecure. She bit strangers and even attacked Rose (who was pregnant at the time). Worried, Rose took Kierney to a notoriously harsh obedience class, and for a while thereafter everything seemed okay. Six months after Rose’s daughter was born, however, Kierney began to experience epileptic seizures with increasing frequency, and barely two years later she died in Rose’s arms at the vet’s office. The finality of her death made Rose question the meaning of life even more, as she felt the “wind of universal malevolence.” Eventually, however, she acquired two other border collies, who also had a remarkable knack for understanding human speech. The author goes so far as to conclude that language itself may be God, insofar as it enables us to break down the bonds of individuality. A heartfelt tribute to animals and their extraordinary ability to love, learn, and teach.